Hair Ye, Hair Ye – PGA Tour can’t cut it! A week or so ago, I read a good article from Garry Smits of the Florida Times-Union that joked about the PGA Tour cracking down on grooming – not of greens, but of golfers. I have to say that I had mixed feelings about this whole issue when I read about it. Although Charley Hoffman’s tresses do not appeal to me, there are some men who look better scruffy than groomed. And some might even argue the “Samson theory” that their locks are not just for looks. 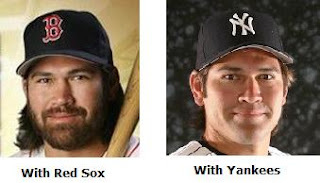 Take one of my very favorite baseball players,Johnny Damon (2nd only to Ichiro). In 2004 when he was playing with the Red Sox, Damon’s batting average was 304 – in 2005 it was 316. Then in 2006 JD joined the Yankees and look what happened – those idiots chopped off his hair – all of it (and some argue…his mojo). Now you tell me, who do you think looks hotter – Red Sox Johnny or Yankee Johnny? Silly question, I know. It’s obvious. But did you know that after he was scalped, his batting average dropped to 285 and plunged further in 2007 to 270! Yikes! Thank goodness, in 2008, Johnny found a bit of his magic again with a 303 BA, but it was a scary couple of years. Nope, you shouldn’t mess with the mess. If it works, don’t fix it! Some are studs, while others – duds. 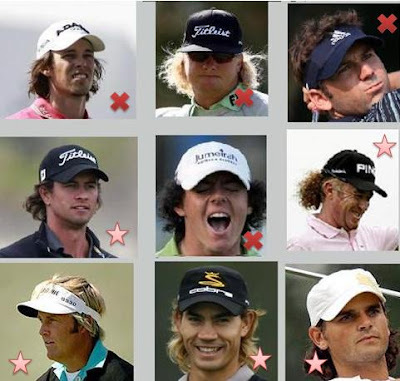 Now, this is just one golfgal’s opinion, but I think Baddeley just looks bad – Sergio looks silly – Rory’s hair’s gory – and Charley’s makes me chuckle. Anyway, I have decided (after writing this post) that I don’t want to see the PGA Tour messing with success. Let the boys have their fun and their hair. But the thing I never want to see the Tour change is the long pant rule Sure, watching CV strut his stuff would be great if he legs look half as good as his biceps, but the thought of having to watch Boo bend over in boxers is enough to make me switch to golf radio. The PGA has a history of clean shaven golfers. Which is why most of them go on to endorse things like Master Shave and Gillette.